Neumayer-Station III, also known as Neumayer III after geophysicist Georg von Neumayer, is a German Antarctic research station of the Alfred-Wegener-Institut. It is located on the approximately 200 metres (660 ft) thick Ekström Ice Shelf several kilometres south of Neumayer-Station II. The station's assembly kit was transported to its current position early in November 2007. It is moving with the shelf ice at about 200 meters per year towards the open sea. After almost ten years of work on the project, beginning in October 1999, including conception, environmental impact assessment, planning and construction phases, regular operation of the station began on 20 February 2009. The station replaces the Neumayer-Station II and the Georg-von-Neumayer-Station that preceded it. The expected lifespan of the station is 25 to 30 years and the entire project is estimated to cost €39 million. The station was constructed 6 m (20 ft) above ground on a temporary two-level platform, and it now rests on 16 hydraulic columns set on a solid snow surface. A garage and further technical equipment are located within a subsurface snow cavern at the front of the station. The moving concrete supporting feet are powered by hydraulic machinery. Through an annual lifting procedure of 80 to 100 cm (31 to 39 in) it is expected to prevent new snow from causing the platform to sink. The station runs all year round and includes 210 m2 (2,300 sq ft) of laboratory surface, divided into 12 compartments. It has twice the floor area of previous stations. Within the 15 living compartments there is room for 40 occupants to sleep. All inner rooms of the platform are built as self-contained units, some of which have aligned connecting passages, depending on their size. The compartmentalized interior of the station is enclosed in sheet metal with an interior polyurethane rigid foam insulation. The green metal girders in the “structure section” image indicate snow level; they are not part of the final structure. All items below the girders will later be embedded in the Antarctic snow. 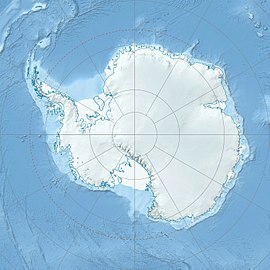 The above-surface construction method of Neumayer III is predominant in the Antarctic, seen at other new stations such as the American Amundsen-Scott South Pole Station and the Belgian Princess Elisabeth Base. A majority of the construction materials and the heavy steel frame were delivered by the end of January 2008. The plan specified that the last of the construction equipment had to leave Ekstrom Ice Shelf by March 2009. For, A crew of about 90 worked on construction. By mid-January 2009, the exterior work on the station was completed, so that further improvement to the 99 interior containers could continue unaffected by the weather. In addition to the previously mentioned laboratories and accommodation areas, there is a south-facing lounge with many windows, a laundry room containing two washing machines and two dryers, a sauna, an information technology room, shower and washrooms, a dining room with a serving window connected to the kitchen, a conference room, medical treatment rooms, operating rooms, storage rooms, a refrigerated area, a dressing room, a room for the heating system, a planning and training room, and a water-treatment room. In order to minimize any effect that the main station's regular operations might have on the accuracy of scientific projects, small remote platforms are set up at a distance of 900 to 1,500 m (3,000 to 4,900 ft) from the main station. Magnetic, seismic, trace element, and acoustic research are the chief research missions of these remote stations. Previous Neumayer stations have been the center of continuous research since 1981, especially with respect to their observatories. In addition to the main research areas of meteorology, geophysics and atmospheric chemistry, which have been studied on the stations since the 1980s, infrasound has been studied for five years and marine acoustics since 2005. Neumayer station experiences a very cold and windy ice cap climate. In the winter, it is not shielded from the cold air masses of the interior, and as a consequence, on average the temperature drops to or below −40 °C (−40 °F) 10.3 times per year. The coldest temperature ever recorded was −50 °C (−58 °F) on July 8, 2010. It also experiences strong katabatic winds. On average, the wind speed reaches or surpasses 100 kilometres per hour (62 mph) 9 times per year. The highest wind speed ever recorded was 187 kilometres per hour (116 mph) on July 16, 2013. In that moment, the temperature was −22 °C (−8 °F), decreasing the felt temperature to −47 °C (−53 °F). There are 1430 sunshine hours per year. ^ "Neumayer". Airport Nav Finder. Retrieved October 16, 2018. ^ "Wind Chill Calculator". www.calculator.net. Retrieved 2017-04-09. Wikimedia Commons has media related to Neumayer Station III. This page was last edited on 12 March 2019, at 20:18 (UTC).